As Eamon lay dying he made Haskell swear to watch over and guide his son Bryant. After Eamon's death Haskell needs Bryant's companionship as much as Bryant needs his, but Bryant needs more than a dragon's company. Haskell knows Bryant needs both a mate and citizens for Dracona. The queen dragon tells him that Dracona must be reborn or there won't be anyone to care for the eggs for they are the last of the dragons. 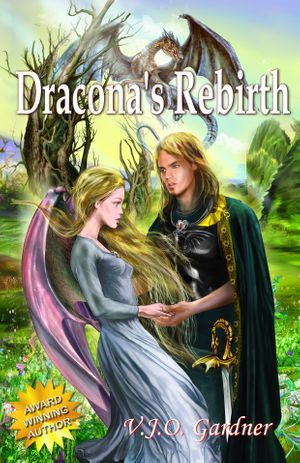 She tells him that Bryant is the one that will be able to wield the enchanted sword that was forged centuries ago in dragon's fire, but only after he finds love which will open his heart to others and accepts his his true heritage. Bryant Donley is a man with a dark past. As the last lord of Dracona he rules over an empty kingdom. He is feared by the neighboring villagers and abandoned by his family. As Lord Dracona it is his duty to marry, but what woman would willingly accept his proposal and a future in a dead kingdom? When he investigates a campfire in his forest, he has no idea how much his life is about to change. Sonje as the crown princess of Glynis is in search of a new home before their valley is destroyed by volcanoes showing signs of erupting soon. While hiding from the man who murdered her mother Sonje's father is bitten by a snake. The feared Lord Dracona demands that Sonje live with him in payment for saving her father's life. When she arrives in Dracona she finds Lord Dracona to be both handsome and kind but is he the answer to her quest? The empty town needs citizens but when she meets Haskell she wonders how her people will feel about living with dragons.